This weekend, Venice celebrated the Regata Storica – a traditional flotilla and boat race that draws crowds of locals and tourists alike. Named as one of Lonely Planets ‘Worlds Best Festivals’, this is a Venetian event not to be missed. 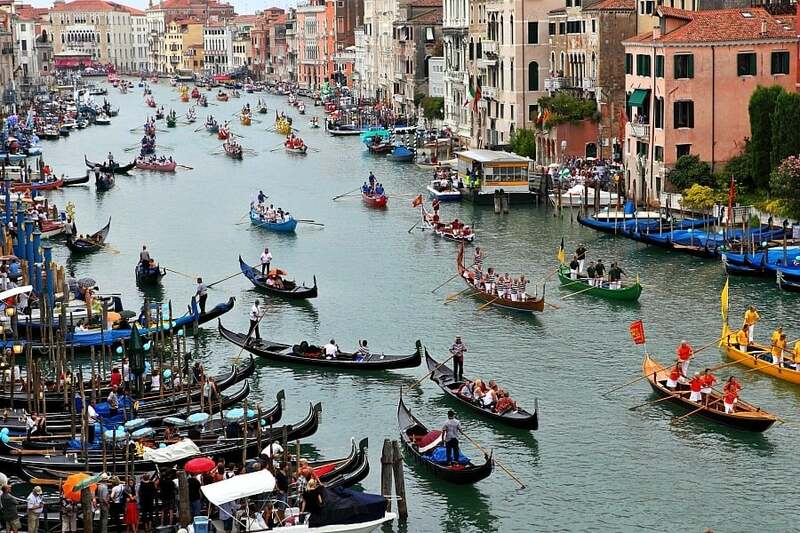 Over 120 brightly decorated Gondolas and small boats parade through the Grand Canal, manned by crews who often dress in 16th century style costume. The flotilla precedes the main event in the Venetian rowing calendar, a sport which has been practised in the lagoon for hundreds of years. The traditions date back to Veneto’s origins as one of the most influential Mediterranean Maritime Republics. Four races take place, each displaying teams of different ages and different types of boat. Similar rowing races date back to 1274 and the pageantry of the parade commemorates the welcome celebrations given to Caterina Cornaro, the wife of the King of Cyprus, in 1489. Locals were pleased to host Caterina as she decided to forgo her throne in favour of the city of Venice. The celebrations take place in the second Sunday of September. Venice makes a great all year round destination, discover it on our painting and cooking holidays. Want to find out more? Then check this year’s availability here or contact us today!